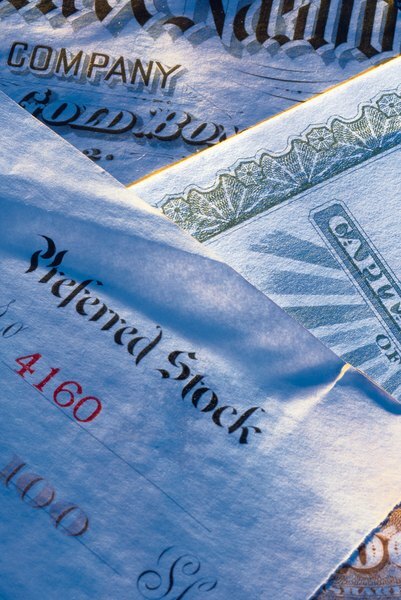 Preferred stock offers high-dividend yields but little potential for capital gains. 2. What Happens to Dividends in a Stock Portfolio? Income-oriented investors tend to favor stocks that pay high dividends, even if these stocks don’t show much price movement. Dividends are distributions of profits to holders of a firm’s common or preferred shares. The annual dividend amount divided by the stock price is the dividend yield, and high-dividend funds own stocks with above-average dividend yields. The S&P 500, an index of widely-traded common stocks, had a dividend yield of 2.13 percent at the end of 2012. At that time, the yield of the S&P Preferred U.S. Stock Index stood at 6.03 percent. High-dividend open-end mutual funds are pools of invested cash allocated to common and preferred shares that pay relatively high dividends. The mutual fund company issues shares for new investments and cancels share when investors cash out. Open-end mutual funds do not trade intra-day and publish their closing net asset value each evening. Mutual funds offer instant diversification and professional management, for a usually modest fee. A high-dividend ETF owns a basket of stocks tied to an index of high-yielding stocks. Many of these ETFs specialize in preferred shares. ETFs are actually stocks and trade on exchanges throughout the trading day. ETFs usually have very low management fees because they replicate an existing index. Because ETF shares are subject to supply and demand, their market price may vary slightly from the fund’s net asset value per share. The highest ETF dividend yield in 2012, 30 percent, was provided by a fund composed of Brazilian stocks. These funds are similar to ETFs, except they are not tied to an index and can borrow money to increase their holdings. CEFs often trade at a discount to their net asset values, which has the effect of boosting their dividend yields. CEF shareholders may face dilution, or share devaluation, if a CEF issues additional shares, but these funds usually offer new shares at a discount to existing shareholders as an anti-dilution measure. CEFs tend to have high fees. Funds periodically distribute dividends throughout the year and must distribute capital gains by the end of the calendar year. Shareholders receive Internal Revenue Service Form 1099-DIV showing an investor’s dividend income for the year and the percentage of dividends that qualify for favorable tax treatment. Qualified dividends are taxed at 15 percent for taxpayers in the 25 percent bracket or higher. Lower-bracket investors pay no taxes on qualified dividends. You must have held the fund for 60 days to be eligible for qualified dividends. What Annual Fees Would You Typically Pay for Your Mutual Fund Investment?